Production: Clear and bold with outrageously textual tone on the instruments diminished behind perhaps too much polish, a mix that leaves keyboards high and back-of-room over everything else but preserves all instruments clearly. Review: Swooning beautiful melodies and dark passages of dissonant but electric sweet attraction within the song propel this music, its dissidence drawn from the school of fantasy and the mystical, who illustrate a vast potential to drown out the tedious mediocrity of the world. Dimmu Borgir make flowing and sweeping melodic black metal with small parts of melodies held together in the encompassing mood of the aesthetic, its catchy, goofy and sometimes heavily kitsched but consistently attractive melodic mainlines. In this style the percussion patterns remain consistent for each segment of the song, allowing the stringed instruments to define the shifting elements of the overall rhythmic signatures, covered by keyboards adding counterpoint melodic patterns or integrating into the dominant tendency another layer of aesthetic. Each instrument can define its own leads when necessary or add complexity behind segmented complexity. Drums provide an example of complexity integrated under very simple external structure; like most atmospheric or ambient metal bands they bash along a dominant rhythm with subpatterns providing internal tension and balance to the overarching tendency. This deconstruction allows the anarchistic distribution of the concept of the song into finely differentiated pieces which evolve a mood from shaping to conclusion with shadows contrasting ideals. As the beats hold themselves apart, the melodies pour through in the stream of subrhythm specified by the strumming hands of the guitarists. Over this flows the tonal abundance of the keyboard, holding the textural voice of the guitar at opposition, all synchronized to the alternating pulse of drums and directionally defined by the sharper, more chaotic percussive aspects of individual phrases of drum track. Careful use of snare (variations on technical death metal double-hit drumming, more on the off beats), highhat and cymbal microhit riffing, and tom enable the complexity beneath such simple rhymes of musical affinity to direct what is otherwise detached and repetitive patterns sometimes recognized as epic for their invokation of cultural resemblances (illustrated here by the bizarrely half-good half-awful classical-esque keyboard compositions and baroque music layered to introduce the final track). Where this succeeds is its organic romanticism which can accept its frivolousness, laziness and cheesiness as part of an epic attempt to communicate another vision of world, like a layer of understanding beyond what mortal minds attempt to comprehend. The over-emotionalism can bug you out, but if you can train your brain to release itself to enjoy this music it is a distinctive take on ambient construction. The tones used here are simple variations in relatively conventional styles, not needing more than very simple elements of similarity and dissonance to create the fractional patterns collaged to build linear songs. Vocals help string it together, by either chanting thick darkly inflected voices to the leading rhythm of the song, or by adding another internal rhythm to the vector of each phrase in a black metal screech complacently socketed in echo effects. 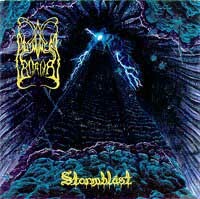 Texture of the vocals does not vary much at all, which is where a more serious (Burzum) vocalist would add another interpretation in small rhythms and timbre changes. The keyboardist is out of control, with two or three major breaks or intros per half album, creating both beauty and streamlined functional objects in songs and predictable happy keyboard turd that periodically litters the first half of this thing. Mostly, however, the guitarists save it in time with slashing rainfall of guitars racing through the cataclysmic strife of indefinition. In this there is a profound abstract presence of nostalgia in this music: the perfectly formed, conventionally-coherent keyboards against the guitar, which is mostly rhythm and timbre with melody adding complexity. The more concrete elements of these songs are some amazing rhythms and tangibly powerful guitar lines that, although simple, bring the metal into this music as fundamental logic. Overall structuring while simple and frequently repetitive, brings suprises in continuity and expectations, and the pattern-level structuring of this conception provides a simple lexicon of phrase attributes which are manipulated here for ambient effect, breaking the idea of the whole through each incarnation of the many subelements (in this case, the sample of time between beat(s)). It would be foolish not to recognize the cheese factor here, however; this can be portrayed as sappy material without damaging its essential character, but even in the language of emotional retards these individuals have managed to express something vaguely sublime in their musical meanderings. I enjoy this release and recommend it with the filter attribute of overemotionalism.